Life Before the Dinosaurs: Cryptolithus. Cryptolithus is a common genus of trilobite. Cryptolithus tessallatus is also called the Lace Collar Trilobite because of the indentations in the cephalon. Adult Cryptolithus had no eyes and felt their way about on the sea floor in search of edible detritus. 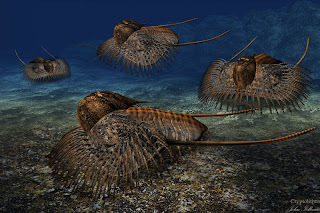 Cryptolithus lived in the Ordovician period and probably had to avoid giant predators such Anomalocaris and Cameroceras. Complete skeletons of Cryptolithus are rare, but fragments of the cephalon are extremely common. The most distinct parts of Cryptolithus are the two posterior spines which were longer than the body. Cryptolithus probably lived at the very bottom where it was too dark to see, because why would something that lives at the very bottom of the ocean evolve eyes? Trilobites like Cryptolithus were very successful until the Devonian mass extinction when only one family of trilobites survived (and then got wiped out in the Permian mass extinction). The use for the indentations on the cephalon is unknown. First people thought that Cryptolithus shook its legs back and forth, dragging water into the cephalon so that the water would go out of the indentations. The edible particles of plankton and detritus would stay in the cephalon and then be devoured. But no one knows for sure, because there is no proof.